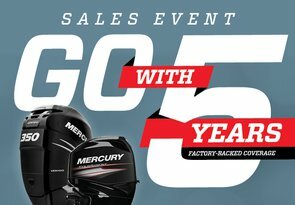 Exclusions: All Mercury Racing, Government, donations as well as engines sold for commercial, camp or resort applications, guide & outfitter registrations, CPO, SportJet Pumps and sales/registrations outside the United States or Canada. Also excludes any non-U.S. or Canada resident, or address outside of the U.S. or Canada. Two-stroke (non-DFI) engines are excluded. Units have to be manufactured in current calendar year and four immediately preceding years. Excludes sales from non-authorized dealers. Engines on the Angling or Sponsorship program do not qualify.